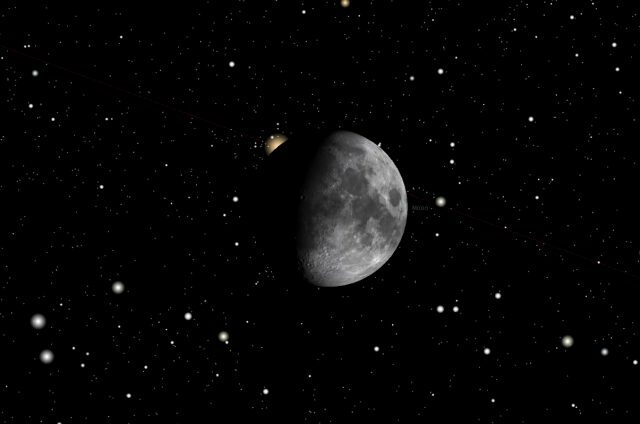 5 Feb. 2017, Aldebaran occultation by the Moon: how to see it? Next 5 Feb. 2017 the Moon will occult the star Aldebaran. This is the second time that such Aldebaran occultation happens this year. Lunar occultations of a star are quite frequent, while the Moon travels across the sky. But this time the occulted star is one of the brightest and famous ones out there: Aldebaran, Alpha Tauri, the brightest star of the zodiacal constellation of the Bull, is a giant star, about 67 lights years from us. 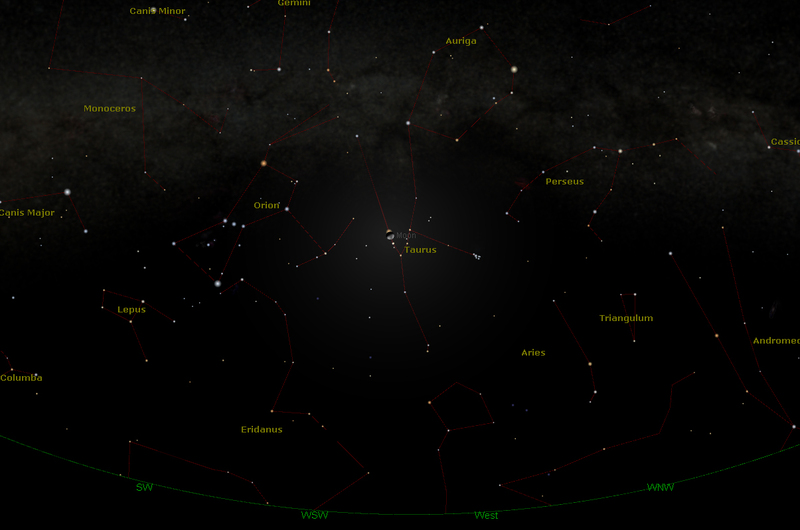 On the background, the Hyades stars draw to face of Taurus. Aldebaran is one of the most spectacular stars, typical of the northern, winter nights, actually one of the first winter stars to appear, announcing the cold season. It shines with its vivid reddish light, making it one of the most colorful stars in the sky. Its magnitude is 0.87, making it the 14th brightest star we can see in our sky. You can easily grab its color, even if you are completely new to astronomy. As any Zodiacal constellation, the Bull is often visited by the Moon, moving across the Zodiac on its monthly journey, plus other adjacent constellations. 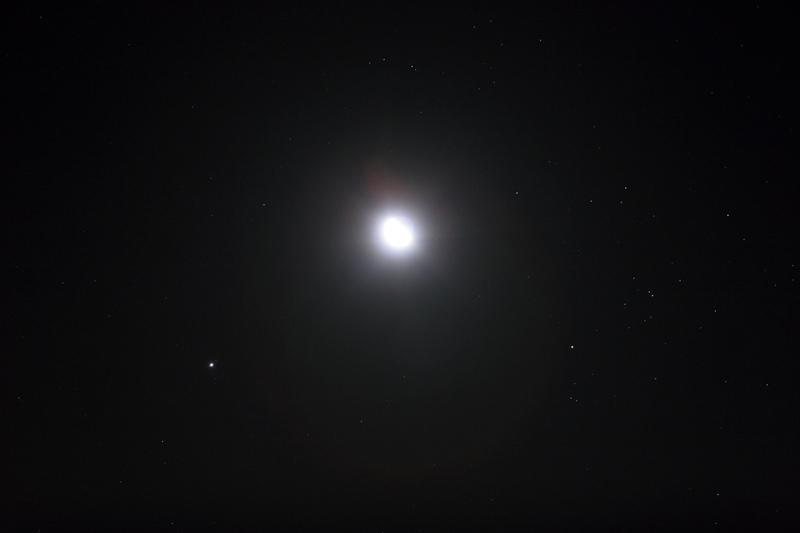 So, from time to time, Aldebaran has chances to be covered, from our terrestrial point of view, by the disk of the Moon. This is called a lunar occultation. 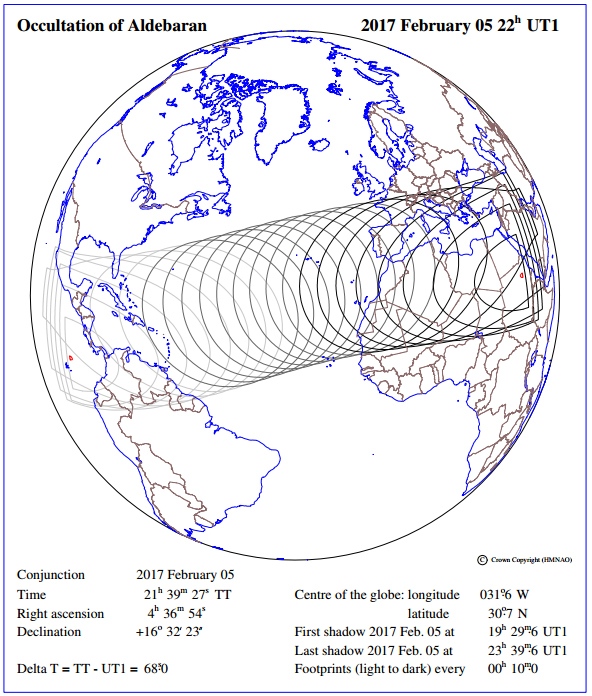 The 5 Feb. 2017 event will be visible from Europe, in particularly from Italy, where the Virtual Telescope Project is based. Below is a chart showing the path of visibility of the occultation. From Rome, looking west at 11:00PM local time (UT+1), the 70% Moon will show close to Aldebaran, among the Hyades. They will be slowly setting and by the end of the occultation, the Moon will be 25 deg. above the western horizon. So, be careful selecting an observing site providing a clear horizon on the west. Minute after minute our satellite, during its apparent ride across the stars, will approach Aldebaran and at 11:21 PM (UT+1) the Moon will occult it, covering the star with its dark, eastern border. It will be a particularly fascinating sight, as the star will disappear suddenly into nothing. Considering the missing/dark portion of the Moon is not very small (phase 70 %), this should help spotting the start of Aldebaran occultation by naked eye. Rome, 05 Feb. 2017, 11:21 PM (UT+1): Aldebaran occultation starts. Less than one hour later, at 00:09 PM (UT+1) of Feb. 6, Aldebaran will show back, popping out from the bright, western side of the Moon. Rome, 06 Feb. 2017, 00:09 PM (UT+1): Aldebaran occultation ends. 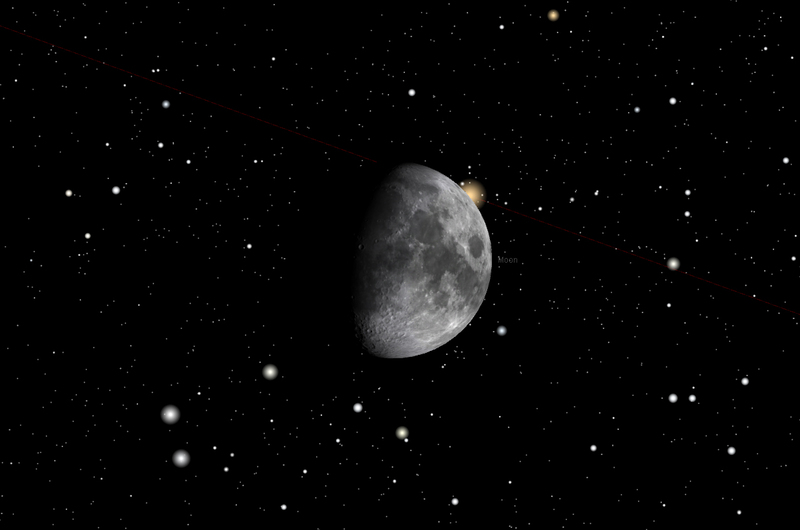 Don’t miss this Aldebaran occultation by the Moon! At Virtual Telescope we plan to show it live, online, STAY TUNED! 14 Nov. 2016 supermoon: the largest full Moon in more than 80 years.